For private charters, advance purchase is required. NEW SAILING TIME EFFECTIVE 6/1/18 IS 8:00 A.M. 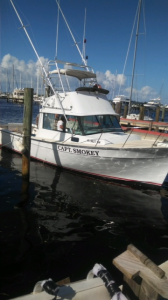 PLEASE BE AT THE BOAT NO LATER THEN 7:45 A.M.
ALL TRIPS ARE LIMITED TO 6 ANGLERS.ALL TRIPS ARE BY RESERVATION ONLY.1-772-696-5631 TO GET ABOARD. WE ACCEPT ALL MAJOR CREDIT CARDS-VISA, MC, AMEX, DISCOVER. 2018 OPEN BOAT SCHEDULE IS TUESDAY,THURSDAY AND SUNDAY.ALL TRIPS LIMITED TO 6 ANGLERS. PLEASE CALL 1-772-696-5631 FOR DATES AND RESERVATIONS FOR OPEN BOAT TRIPS.THE FISHING IS VERY GOOD NOW.COME AND JOIN US AND CATCH YOUR DINNER.PLEASE PICK A BACKUP DATE IN CASE OF WEATHER RELATED CANCELLATIONS. 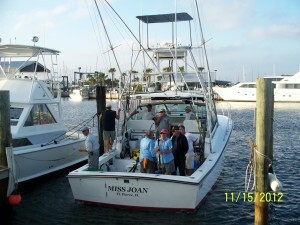 4/9-4/23-MISS JOAN ANNUAL MAINTENANCE-WE WILL BEGIN FISHING AGAIN ON TUESDAY,4/24.